I am surprised that I haven’t had a summons to the HR department over the Googling of this album. Similarly, I am bracing myself for a bit of extra blog traffic over the title and tagging of this post. But what are you gonna do with an album called Suicide by a band called Suicide… apart from be surprised that the name is derived from a Ghost Rider comic book rather than the act of self-slaughter. Thinking on it: Suicide would have been a great name for an emo band with a more metallic edge – like Fall Out Boy meets Megadeth. 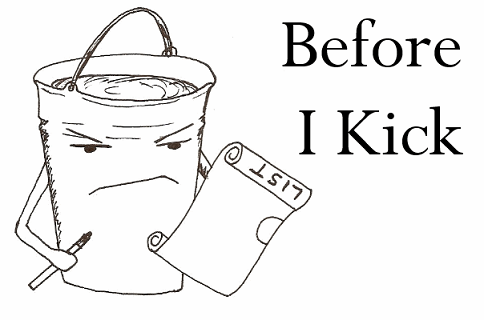 I’m glad that they weren’t as it probably wouldn’t have made for as interesting an album. 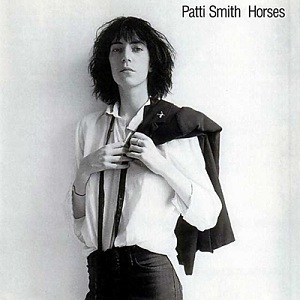 Continuing on from the last album I listened to, Horses by Patti Smith, Suicide is one of the influential punk albums. Not only that, but Suicide is also an interesting landmark for electronic music and is a key stepping stone on the route from rock and roll to noise pop/rock and shoegaze. 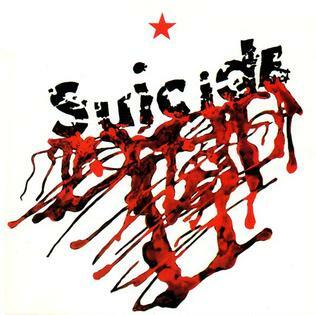 As with many punk albums of this era Suicide is really short at around 32 minutes, with a third of the run time being taken up by the penultimate track. Honestly though I appreciate a shorter album (length being my big issue with the Random Access Memories album). Sometimes an album can overstay it’s welcome and everything on Suicide felt tightly produced. So yes, Suicide feels like a bit of a misnomer. Walking into this I was expecting music that would be overtly emotional, heavy metal or both. Instead I got a minimalist electronic punk rock album. (✿◠‿◠) Anime!!! 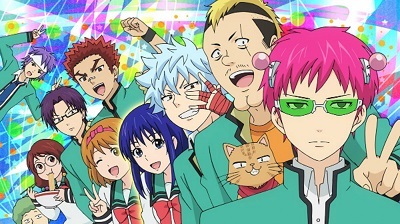 – The Disastrous Life of Saiki K.
The Disastrous Life of Saiki K. is the exception that proves the rule when it comes to shows on the anime list. Where all others are ~24 minutes per episodes, these are are about 5 minutes each. This is how I managed to watch 120 episodes in the space of a few weeks. When this aired originally aired in Japan it was (usually) one episode per weekday, with a weekly omnibus airing later. It makes for better viewing to see them as bundles, especially when they do a bit of serialization – otherwise I can imagine it getting a bit hard to follow, which was my issue with Senyuu. Much like Nichijou, this is a gag anime – it’s just that all the 5 minute vignettes are led by the same character: a deadpan high school student with ridiculously powerful psychic abilities called Saiki Kusuo. The episodes mostly centre around him trying to avoid his annoying school mates, eating sweets and trying to look as average as possible without his powers getting in the way. What powers does he have? Well, pretty much everything you can think of. Telepathy, teleportation, clairvoyance, pyrokinesis, super strength… the list goes on and is added to as required in the episode. I actually like the idea of having a character (much like Saitama in One Punch Man) where the joke comes from them being so ridiculously overpowered. It makes a nice change from more serious shows where they derive drama from limitations. On the whole this series felt like a good diversion. Sure the jokes were silly, but after time in the office you need to watch something a bit goofy. It would be interesting to see this as a proper length show, but I can see how dragging the storylines out for a half hour would negatively affect the series. I have known about the banana blossom salad at Pho for well over a year, but have been put off it because of an allergic reaction I once suffered after eating one of their soups. It’s 18 months later and I’m feeling bold, brave and the need to get another food item in since this list is starting to slow down. From the picture you would be forgiven to wondering where the banana flowers are. Honestly, I wasn’t convinced of this until I read a recipe for beef and banana blossom salad on the train home. 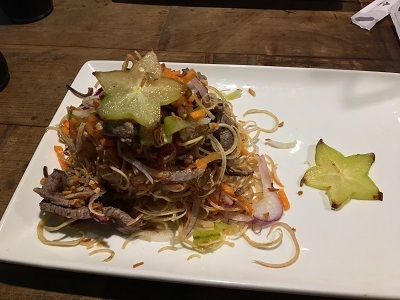 Essentially, the shredded vegetable whose texture felt like a mix between cabbage and water chestnut was the banana flower. It’s just, for whatever reason, I expected to be eating the anthers rather than the petals. In terms of taste, the shredded banana flower (petals?) tasted like crisp, slightly nutty cabbage. I guess that I was expecting more of a fruity taste from the flower of the banana plant? I can see how this would make for a good base for salads and would like to try my hand at making something from them. I’d just need to find somewhere that sells them instead of relying on a restaurant to do it for me. Well, I had to break my recent streak of American films at some point. Probably helped that I haven’t listened to a movie podcast for a while and had the urge to follow-up with a viewing. So why not a French movie starring one of my favourite French actresses? Going into this I had no idea what Belle de Jour was about. All I knew is that this was likely to be interesting (because of Luis Buñuel) and not be like any of the new wave French films that continue to turn me off. I probably would have known more about this film if I had ever watched The Secret Diary of a Call Girl. To cut a long story short, Belle de Jour is a film about a bored housewife (that daydreams about being sexually dominated) who becomes a prostitute. So that her husband doesn’t find out she only does this the afternoon, thus earning her the name ‘Belle de Jour’, or ‘Lady of the Day’. As with all things, the moment she gets into it and starts to enjoy it everything starts to fall apart. One thing that’s interesting about this film is how you spend so much time in Belle’s head that you are not always sure of whether you’re in the real world or in one of her fantasies. Usually it’s clean cut, but there are times (such as the ending) where it feels ambiguous. My favourite instance (which was also the weirdest) of this was when her client asked her to pretend to be his dead sister lying in a coffin so he could get his rocks off. As an audience member I think I was as confused as she was. I really did enjoy this film, even if just for the interesting take on suburban prostitution. It’s nowhere near as risque as In The Realm of the Senses (then again… what is). I’ve also got to thinking that Belle de Jour is the third Catherine Deneuve film I have seen for the list after Repulsion and Les Demoiselles de Rochefort. With her talent and her looks it is little wonder that she still has a number of films on the list yet for me to see. Who knows, maybe either The Last Metro or The Umbrellas of Cherbourg will be the next film I see. Whenever I go on holiday I am on the lookout for food items for my list. 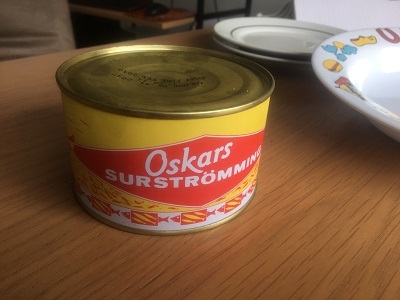 Surstromming is the only example of something that I specifically did not get because of both my inability to bring it home and the inability of eating it in Sweden (after all, who brings a tin opener on holiday). I would have brought a tin back with me, but apparently British Airways have a policy of not allowing this particular tin of fish on their flights. I’m guessing that the possibility of the change in pressure releasing the smell from the can is too much for them? In any case, I bought my tin from the good people at ScandiKitchen who, when I collected the tin, wished me the best of luck when trying it. I’m beginning to lose count of how often I’ve been questioned over my food choices in the pursuit of finishing this list…. So there it is. We had a scented candle at the ready and a large bowl to prevent any of the liquid from seeping into our table. If you watch any of the videos online of people trying surstromming it’s usually full of gagging and people throwing up because of the acrid smell and taste. Now… I might be weird, but the smell wasn’t too bad for me. I mean it was a bit like what I would imagine spicy tuna-flavoured cat food would smell like. It wasn’t the awful smell I was expecting, just a bit weird. So now all we had to do was taste the thing. 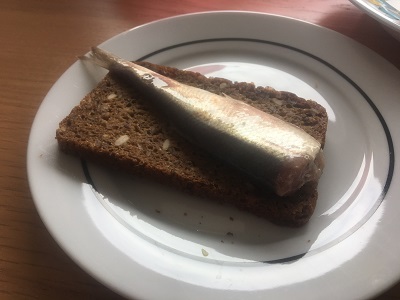 I didn’t want to just eat the fish by itself, so I got myself some Danish ryebread to have it on. I’m glad of this because surstromming is beyond my moral understanding of saltiness. It was also had a sweet fish taste with a bitter afterthought. The only thing that stopped me from eating the whole thing, however, was that this still had all the bones in. I know some people are able to eat fish like this, bones and all, but I really hate the mouthfeel. Thanks to my near religious watching of Iron Chef I was able to gender the fish we ended up eating. The roe from the female fish was nice enough, but the milt from the male fish was especially gorgeous. I later tried this with a bit of tzatziki and it was a true marriage made in weird fusion-cuisine heaven. If I could get filleted surstromming then I would happily eat this again (which I think makes me weird) with some plain yogurt and some dark bread. Maybe I should just move to Sweden. I like to think that the comic choices that myself and the hub make say something about us. For example, he picked out Mopsy for us to read (make of that what you will) and I opted for Parasyte. I mean, it helped that this was also on my anime list… but I enjoyed this incredible contrast too much to not draw attention to it. So what is Parasyte all about? Well, think of it as a sci-fi horror manga about parasites that are taking over human bodies and trying to take over the world. These parasites, once inside the human, have a hunger for human meat and are able to attack by turning parts of their body into fast moving knives. At the centre of this is high-schooler Shinichi who, thanks to a freak accident, is infected by a parasite… but the infection stops at his right elbow. 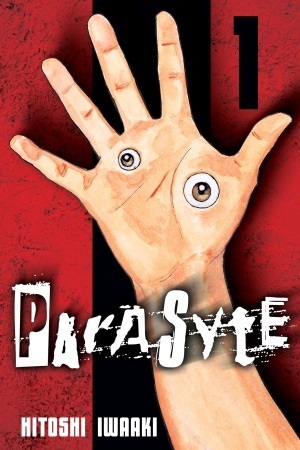 This leads to the main dynamic of the manga as the shy high school student interacts with the parasite infecting his right hand (later named Migi) and is forced to take part in the human battle against the parasites. What really made this manga an enjoyable read for me was the body horror angle. 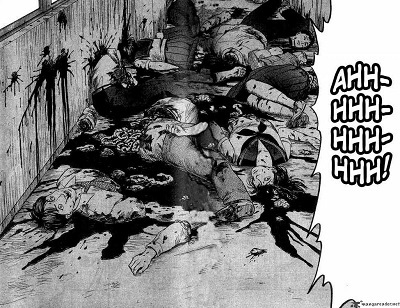 You have heads unfurling into teeth, blades and other weapons, people being sliced into pieces… it’s a glorious gorefest that I can appreciate as a manga or an anime but would turn my stomach if it was done as a live-action. Over the course of 64 chapters I was utterly absorbed in this battle between human and parasite to the point that it felt like it ended too soon. I ended up reaching the latter chapters and it began to see that this was wrapping up, if I’m honest, a bit too easily for the humans. Would it have been good to see the parasites spreading outside of Japan and the world being on the verge of destruction? Probably, but then again this wold have lost some of the charm of keeping this very much a local phenomenon with Shinichi as the emotional core of the piece. I paint it this manga as being just a gorefest (and it has a lot of gore), but there are flashes of humour and real emotion. The deathcount in a manga like this is high and the cost that it takes on Shinichi becomes an interesting measure of how much he is being effected by the (rather friendly) parasite that he has been stuck with. Of course, I am now interested in how this translated onto the small screen. But I think I’ll have to first make my way through some of the sports animes before I get to that. At least I’ll have something to look forward to. I remember that about 11-12 years ago there was a programme on Channel 4 about the best albums of all time. I have a rough idea of how long ago it was because I remember writing a ridiculously over the top diary entry about Jeff Buckley and how I had achieved nothing in life. I was 15 and dumb. I bring this up because this programme inspired me to listen to Horses for the first time… where I didn’t get past track one. Here we are 12 years later and all the way through Horses I was just thinking to myself, ‘I get it now’. When I was 15 my musical taste had barely developed. This was before I discovered the music of Bjork, Beck and PJ Harvey (aka the trinity that saved me musically) so I was nowhere near ready for the album that is said to have truly started off punk. Since Horses was released a few months before the Ramones… I’ll have to agree with this sentiment. When you listen to Horses it’s hard to not think of all the artists that have come since. Someone like PJ Harvey owes a lot to Patti Smith as both a trailblazer for women and as an inspiration for their music. There were times where I was listening and I could have convinced myself this was going to eventually segue into ‘This Wicked Tongue’ or any track off of Hole’s Live Through This. It’s an understatement to call this album revolutionary. The fact that this was a debut is all the more impressive. Horses is an album that didn’t just inspire a genre, but generations of musicians to come. For me this feels like a better Bob Dylan who has more bite and is someone who you can rock out to. If that isn’t a reason to enjoy this album I don’t know what is. So apparently this is the most recent film that I have seen for the 1001 list since A City of Sadness as well as the continuation of my run of US films. It’s also the latest in a run of films that I’ve watched thanks to a podcast, in this instance a guest appearance made by Paul Reiser on Comedy Bang Bang. Probably would have made more sense to watch this if I knew who he was… I had no idea who I was meant to be looking out for. Even though I didn’t know who Paul Reiser was there were enough well-known people in this film to keep me occupied. For a lot of them, like Ellen Barkin, Mickey Rourke, Kevin Bacon and Steve Guttenberg, these were early major roles. Similarly this was the directorial debut of Barry ‘Rain Man’ Levinson… so I guess that the point I’m trying to make here is that this was a formative film for many people who found future success. With this in mind, I probably went into this film with higher expectations that were warranted. As a comedy-drama that is ranked by the American Film Institute as one of the best comedies of all time… I was never had that moment where I could say I was close to chuckling. It’s similar to my experience to American Graffiti and Fast Times At Ridgemont High in that I don’t think I share the same humour. Also, I’m not sure I actually could hand-on-heart say I liked any of the main characters too much. 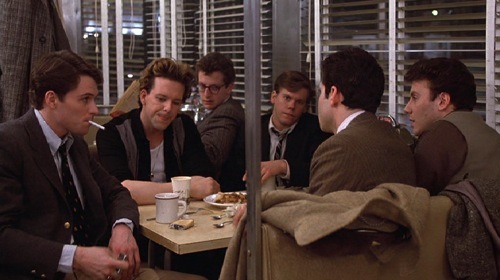 In Diner we are thrown back to the final weeks of 1959 where a group of male friends reconvene in their hometown in order to attend the wedding of Eddie (Guttenberg). The idea being that in this week these men, having left college, are starting to have the realisation that adulthood beckons. On the face of it this is a great idea for a film and I usually love a period piece. However, the year being 1959 just feels incidental – aside from the technology and the current events it could really have been set in 1980s America, albeit in a bit of a backwater. Similarly, when you have a film like this you need to at least feel something for the characters so you can bask in their glories and commiserate in their failures. I felt fairly little for any of them apart from Barkin’s character during the argument over the organisation of a record collection. I’ve been really negative, but it’s not like I hated this film. It was fun enough to watch, especially the scene where they’re all together in the titular diner. When you split the group up… I started to have difficulty telling them apart with the exception of Steve Guttenberg. I guess, in the end, I wish it dug a little deeper. Another classical piece so soon? And one that broke the streak of different blog entries? This should be a special piece of music! Well to me it is and, now that I have listened to the whole suite, it has become even more so. To start of with, I picked Lieutenant Kijé Suite as the next classical piece as it’s ‘little grey dove’ refrain from the Romance movement is the only piece of classical music that I was actually able to memorise during the mandatory school music lessons (I am not counting ‘Hot Cross Buns’ on the recorder as a classical piece’). Now that I hear this refrain within the context of this classical piece I love it all the more. What I did not realise was that the Lieutenant Kijé Suite also contained the classic ‘Troika’ movement. So when I first listened to this at work and this piece of Christmas classical music started to play I became a mess of goosebumps for a solid four minutes. The whole suite itself has a rather weird history. Originally the Lieutenant Kijé Suite was music to a 1934 film of the same name. 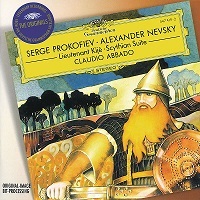 So impressed with Prokofiev’s work on the soundtrack, the Moscow Opera Symphony Orchestra commissioned him to turn his fragmented musical pieces into a fully fledged piece for an orchestra. It was part of the Soviet Union happily welcoming Prokofiev back into the fold after his return to his homeland after spending a lot of his time Paris. As a suite of music it is split into five distinct movements, with the whole piece lasting 20 minutes. Since this being derived from different parts of a movie soundtrack it feels like an EP of 5 distinct tracks than a suite of music… or maybe I just need to start getting used to this terminology as I investigate more classical music. In any case, for the merit that it gave me incredible goosebumps and it almost made me cry out of joy the Lieutenant Kijé Suite is easily one of the best pieces that I have heard so far for this list. I’ll probably be back in the world of church music for the next classical piece… so someone please pray for me.